(Nanowerk News) The vine-tree structure is widely observed in nature when the plant is with a growth habit of trailing or climbing stems. The vines use trees for growth rather than devoting energy in a lot of supportive tissue, enabling the vine to reach sunlight with a minimum investment of energy. The trees may also facilitate the transportation of nutrient substances. Such hierarchical vine-tree structures offer the synergy between the vines and trees as well as afford the maximum utilization of sunshine and limited soil and space, which could also be a promising universal architecture in both macro- and micro-worlds. The combination of low dimensional nanomaterials with distinct physical and chemical properties into three-dimensional (3D) hierarchical nanostructures has always been a hot research topic due to its ability to inherit advantages of each component and even lead to the formation of advanced materials with unexpected properties for unique applications. Enlighten by the vine-tree structures in nature, a vine-tree-like nanostructure is expected to be with high efficiency for the adsorption and reaction of ions from the electrolyte as well as the transfer of electrons. This could lead to high-performance electrode materials for energy storage devices. New work by Prof. Qiang Zhang and Fei Wei’s research group in the Department of Chemical Engineering at Tsinghua University (China) reports on the in situ self-assembly of vine-tree-like nanostructure using carbon nanotubes (CNTs) as the building blocks by chemical vapor deposition (CVD). This work also provides a general biomimetic strategy toward the design of hierarchical nanomaterials with extraordinary electron pathways as well as tunable surface/interface that can be used in areas of catalysis, separation, and energy conversion and storage. 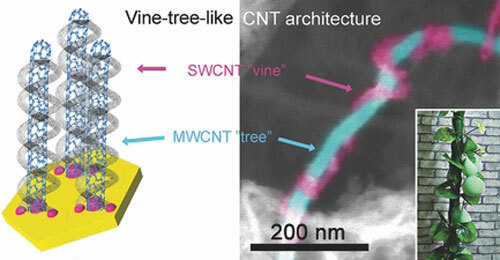 By using catalyst nanoparticles (NPs) with a bimodal size distribution during the CVD synthesis, the scientists have obtained vine-tree-like CNTs (VT-CNTs) that are composed of vine-like single-walled CNTs (SWCNTs) wrapping around the tree-like multi-walled CNTs (MWCNTs). The VT-CNTs, described in the journal of Advanced Materials on November 5, 2014 ("Hierarchical Vine-Tree-Like Carbon Nanotube Architectures: In-Situ CVD Self-Assembly and Their Use as Robust Scaffolds for Lithium-Sulfur Batteries") could serve as excellent cathode scaffolds for high-performance lithium-sulfur batteries. ‘The reason we select CNTs as the model system is due to the fact that the CNTs are one of the most typical low dimensional building blocks during the past 25 years,’ says Qiang Zhang, an Associate Professor at Tsinghua University. ‘The formation of bimodal catalyst NPs is the most important factor. This is because the size of catalyst NPs plays a key role in the wall number and diameter of the CNTs. For our catalysts, the catalyst NPs with smaller size are expected to catalyze the growth of SWCNT ‘vine’ while the larger ones facilitate the growth of MWCNT ‘tree’ simultaneously.’ Consequently, VT-CNTs composed of SWCNT ‘vine’ wrapping around MWCNT ‘tree’ can be self-assembled during the in situ CVD of hydrocarbons. “The self-assembly of the vine-tree-like structure can be ascribed to their trend to minimize the interfacial adhesion energy between SWCNTs and MWCNTs,” the paper's first author Meng-Qiang Zhao explains. “Typically, the SWCNTs formed on tiny catalyst NPs always grow much faster that the MWCNTs grown on large metal NPs. However, the VT-CNT structure herein can lead to the matching of the growth rate of SWCNT ‘vine’ and MWCNT ‘tree’.” The as-obtained VT-CNTs show a high specific surface area of ~650 m2 g-1 and a total pore volume of ∼1.6 cm3 g-1. CNTs are considered as one of the most promising cathode materials for Li-S batteries because of their remarkable electrical conductivity and excellent mechanical properties. However, the low specific surface area (< 200 m2 g-1) of MWCNTs limits their capability to accommodate sulfur at high loading amount and poor cycling stability for the MWCNT/S cathodes. Meanwhile, the SWCNTs are usually entangled with each other, which degrades their ability in the construction of efficient conducting networks. A high capacity of 1418 mAh g-1 per sulfur can be achieved on the VT-CNT/S cathodes. A capacity of 530 mAh g-1 can still be retained even after 450 cycles at a current density of 1.0 C, with its initial capacity as 832 mAh g-1. A cyclic fading rate of ca. 0.08 %/cyc was achieved. A capacity of 997 and 630 mAh g-1 can still be preserved at a high current density of 3.0 and 4.0 C, respectively.